University of Pennsylvania Press, 9780812249767, 264pp. During the thirty years following ratification of the U.S. Constitution, the first American novelists carried on an argument with their British counterparts that pitted direct democracy against representative liberalism. Such writers as Hannah Foster, Isaac Mitchell, Royall Tyler, Leonore Sansay, and Charles Brockden Brown developed a set of formal tropes that countered, move for move, those gestures and conventions by which Samuel Richardson, Jane Austen, and others created their closed worlds of self, private property, and respectable society. The result was a distinctively American novel that generated a system of social relations resembling today's distributed network. Such a network operated counter to the formal protocols that later distinguished the great tradition of the American novel. 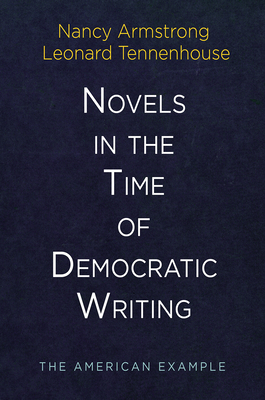 In Novels in the Time of Democratic Writing, Nancy Armstrong and Leonard Tennenhouse show how these first U.S. novels developed multiple paths to connect an extremely diverse field of characters, redefining private property as fundamentally antisocial and setting their protagonists to the task of dispersing that property--its goods and people--throughout the field of characters. The populations so reorganized proved suddenly capable of thinking and acting as one. Despite the diverse local character of their subject matter and community of readers, the first U.S. novels delivered this argument in a vernacular style open and available to all. Although it differed markedly from the style we attribute to literary authors, Armstrong and Tennenhouse argue, such democratic writing lives on in the novels of Cooper, Hawthorne, Melville, and James. Nancy Armstrong is the Gilbert, Louis, and Edward Lehrman Professor of English at Duke University. She is author of How Novels Think: The Limits of Individualism from 1719-1900 and Fiction in the Age of Photography: The Legacy of British Realism. Leonard Tennenhouse is Professor of English at Duke University. He is author of several books, most recently, The Importance of Feeling English: American Literature and the British Diaspora, 1750-1850. Together, Armstrong and Tennenhouse are authors of The Imaginary Puritan: Literature, Intellectual Labor, and the Origins of Personal Life.